1/2-horsepower motor for commercial quality results. Stainless-steel juice bowl and motor base. Pulp is ejected into a molded white plastic container. Two power settings handle hard vegetables like carrots and soft fruits like bananas and tomatoes. MSRP $209 Based on the Manufacturer's Suggested Retail Price, this juicer is priced about average. 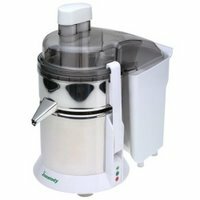 Star Rating 4.4 User reviews, ratings, and feedback indicates that this juicer is rated higher than average by 23 users and ranks in the top 29% of juicers.